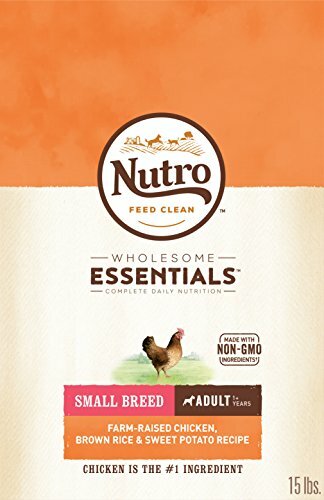 NUTRO WHOLESOME ESSENTIALS Small Breed Adult Farm-Raised Chicken, Brown Rice & Sweet Potato Recipe Dog Food always starts with great-tasting, farm-raised chicken and contains a unique blend of whole grains, vegetables and fruit. This natural dog food provides natural fiber for healthy digestion and essential antioxidants, such as vitamin E, for a healthy immune system, plus vitamins, minerals and other nutrients. These recipes are specifically tailored to meet your small breed’s unique needs, and contain Omega 3 & 6 fatty acids, to promote healthy skin and a soft, shiny coat. NUTRO Food for Dogs follows the THE NUTRO FEED CLEAN philosophy, is always made with Non-GMO Ingredients and is made with no artificial flavors, colors or preservatives. *Trace amounts of genetically modified material may be present due to potential cross contact during manufacturing. Farm-Raised Chicken Is The #1 Ingredient To Deliver Great Taste And Help Support Strong Muscles. Made With Non-Gmo Ingredients* *Trace Amounts Of Genetically Modified Material May Be Present Due To Potential Cross Contact During Manufacturing.